Ah, Memorial Day Weekend at the Jersey Shore. Sun, sand and surf. Arcades, shops and amusements on the Boardwalk. Saltwater taffy and crab fries. Traffic and crowds. 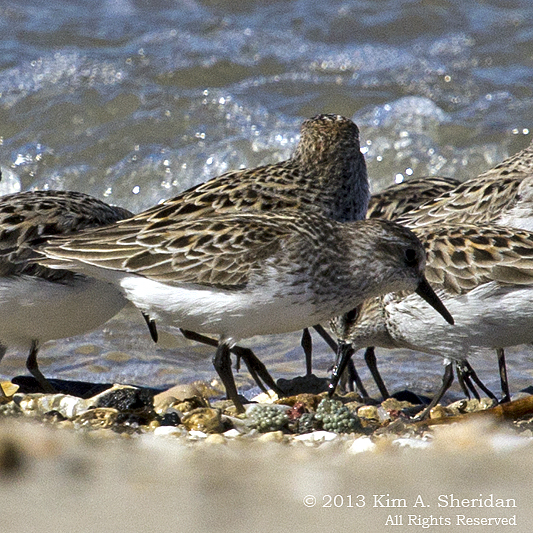 Dowitchers, Turnstones and Knots… Wait – what? 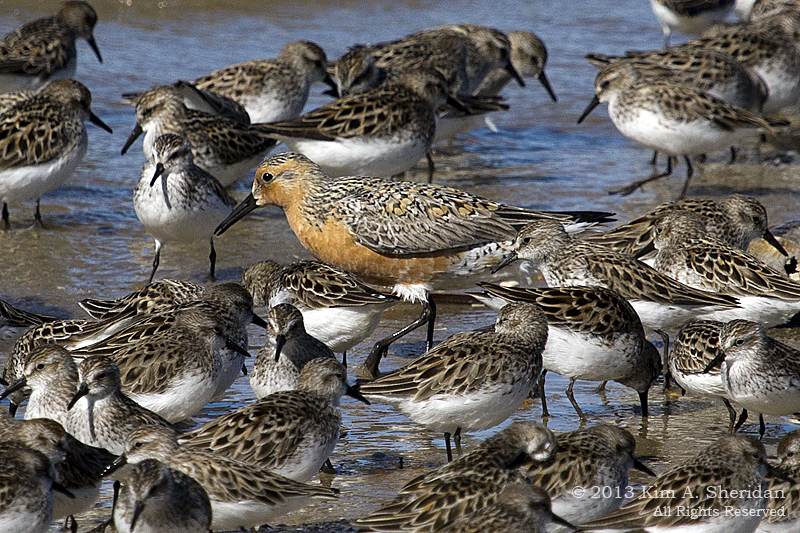 Red Knots are Robin-sized shorebirds that winter at one end of the world and breed at the other. They make the 9300 mile journey in two hops, flying NON-STOP from their wintering grounds in Tierra Del Fuego to the shores of Delaware Bay. They arrive famished and emaciated, with only one thing on their mind – FOOD. Before they can continue their journey to the Canadian Arctic, they must double their weight. They need LOTS of easily available nutritious food. That’s where the Horseshoe Crabs come in. May is the start of Horseshoe Crab spawning season, and thousands come ashore at night to lay their eggs. These little greenish balls of energy provide the nutrition Red Knots and other Shorebirds need to refuel. Look closely, and you will see the eggs at the feet of this Sandpiper. Thousands upon thousands of birds flock to the Bayshore every May and early June for the feast. And flocks of birdwatchers follow them. Better bring a spotting scope or a long lens though! Each spring the beaches are closed for a month or more to allow Red Knots and other migrating Shorebirds to rest and refuel in relative peace. So getting close is not an option. CONSERVATION PIECE: As recently as the 1980s, there were nearly 2 million Horseshoe Crabs in Delaware Bay, and 150,000 Red Knots traveling through the area. Then the Crabs were overfished for whelk and eel bait, and their numbers plummeted to an estimated 200,000 today. Red Knot numbers crashed with them, to 15,000. Knots are now an endangered species in New Jersey, and a moratorium on Horseshoe Crab fishing there was enacted in 2008. The passage of Superstorm Sandy last fall further imperiled these animals, as nearly 70% of Horseshoe Crab habitat was lost. Efforts were made to clean up and rebuild the beaches, but only time will tell what effect those efforts had. Here are some of the other birds feasting at the Shore. 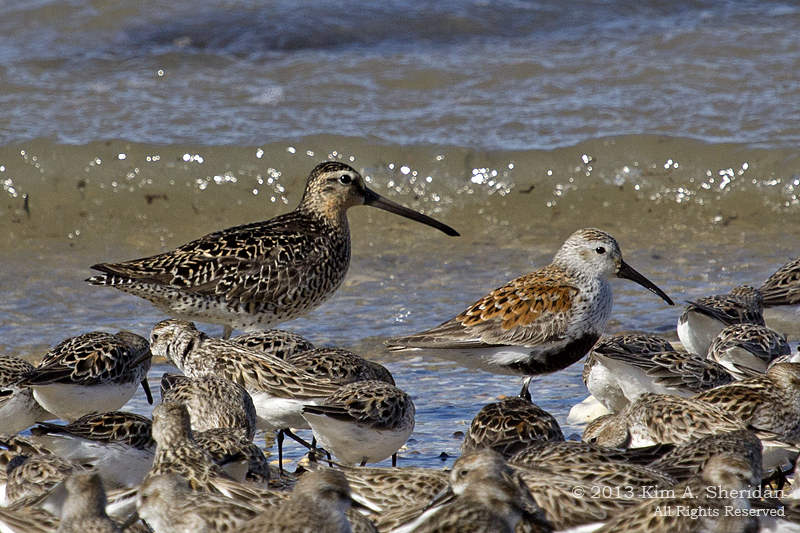 Above: Short-billed Dowitcher and Dunlin. 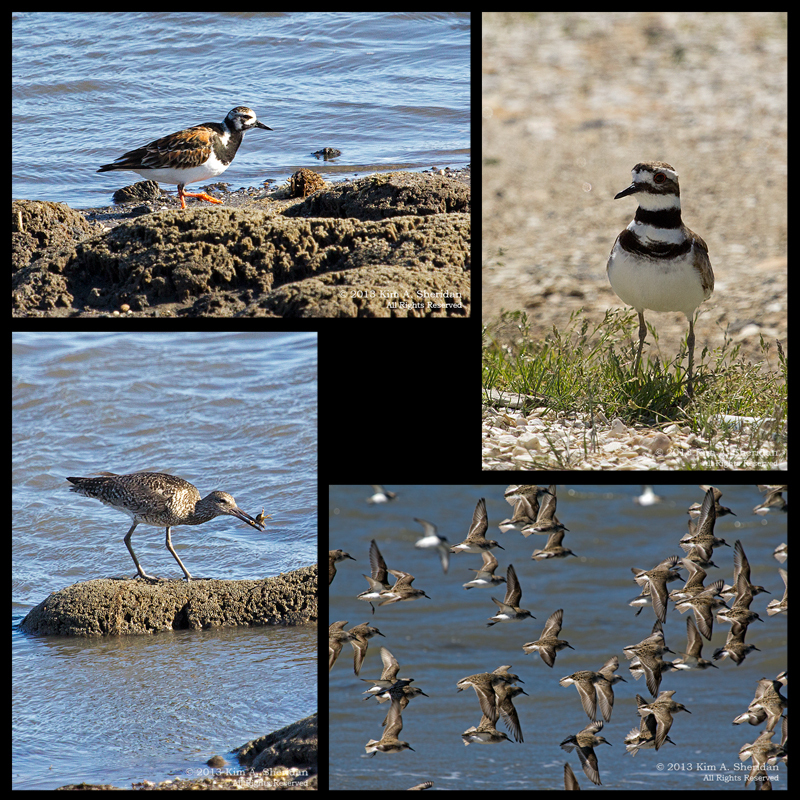 Below, clockwise from top left: Ruddy Turnstone, Killdeer, Sandpipers in flight, Willet with lunch. 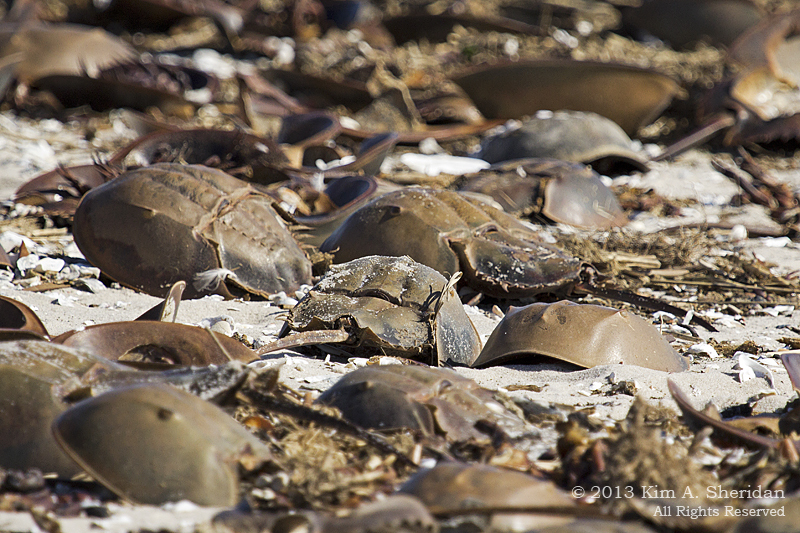 FUN FACT: Horseshoe Crabs are not crabs at all, but marine arthropods closely related to spiders and scorpions! They are so ancient – they’ve been around over 450 million years – they are considered a living fossil. And they have blue blood! That’s due to the copper content in the hemocyanin in their blood that carries oxygen. Not quite the prototypical High Society “blue-blood”. Here’s a typical Memorial Day crowd at the Shore. 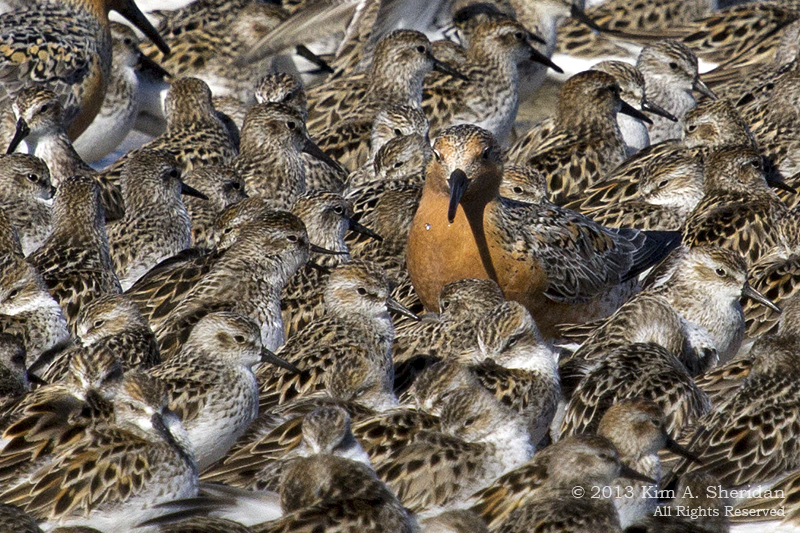 This Red Knot is no doubt wondering where he can get some peace and quiet. 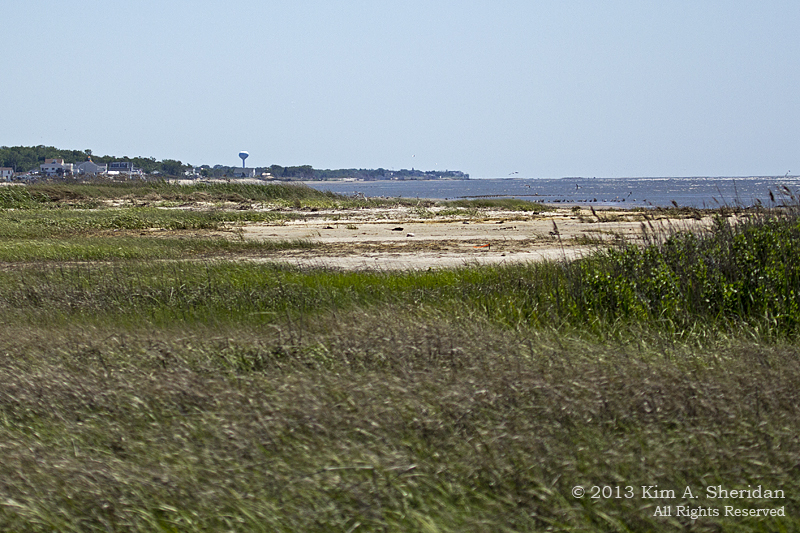 This entry was posted in Birds, Jersey Shore, Nature and tagged Birds, Delaware Bay by Kim. Bookmark the permalink.